Chinese Central Television is interesting. It's worth watching just to guess at what the Chinese government wants to disseminate, but one thing about CCTV that is true is that it's often error prone. In a recent broadcast about violent video games, CCTV claims that GTA was made in 1968. 1968. During a report about the decision by some Australian retailers to remove Grand Theft Auto V from stores, CCTV went into the history of the game. In their history they reported that Grand Theft Auto, a game filled with violence, was made in 1968. Grand Theft Auto, as intrepid Kotaku readers will know, was released in October of 1997. That's three decades after the date CCTV reported. CCTV's report is interesting since GTA is a game on China's extensive ban list, and any cursory search for GTA will provide all the necessary background information on the game, from the makers to the release date. The obvious factual errors and political bias aside, Chinese netizens were having none of what CCTV was putting out. Most comments in China have been focused on whether it was right or not for Australian retailers to remove GTA from stores, but there were quite a few comments lamenting CCTV's bad coverage. Comments included confusion over the choice of over the shoulder images and the Chinese translation of GTA, which is 《侠盗飞车》—something along the lines of "Speeding Courageous Theft." Okay, we can forget about the game coming out in 1968, but can you think of what China was doing in 1968? 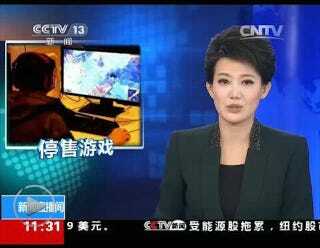 CCTV, I'm speechless, last time you reported on "Red Alert 2: Yuri's Revenge" as real, this time around, can 1968 computers even play games? Being retarded has its limits. 1968, China didn't even know what a computer looks like. Can you talk to CCTV about reason?... how many players actually steal cars? ... So many people have read about the frog prince, have you seen it? How come you're not kissing frogs? As the mainstream media, how could you use this translation for GTA? Let me tell you, the game is called GTA 5. Eric is Beijing based writer and all around FAT man. You can contact him @FatAsianTechie@gmail.com or follow him on Twitter @FatAsianTechie.